Well hello quick knit! Here's another project that I decided to quickly cast on for and made me ditch current WIPs that I have on the needles. And yes, before you ask, this is another Jane Richmond pattern. I told you I'm obsessing over her patterns, didn't I? Even though my Ravelry project page says that this took a day to knit, it actually took about 2 hours total of knitting time. I had cast on in the morning before leaving the house to run errands, worked on it in the car throughout the day, and then kitchener stitched the whole thing together the next afternoon. I'm pretty sure I could have finished it within a day had I not been out and about and then having to fix a 3 year old's train track set every 5 minutes before and after dinner. 1. I actually had the yarn called for in the pattern in my craft box. I had bought the yarn pre-Munchkin with the hopes of turning it into a cute little Bedfellow animal like the ones I made the summer I was pregnant, which you can see here and here. Obviously, that never happened and so the yarn just languished in a bin full of random craft supplies in a closet. 'Til now. 2. Every time I look at this cowl I will forever be reminded of WIlson Phillips. Why? Cause I had listened to Hold On and Impulsive on repeat. The entire day. Seriously. I kid you not. I blame it on Bridesmaids. I think I've watched that movie like, 10 times already. For reals. 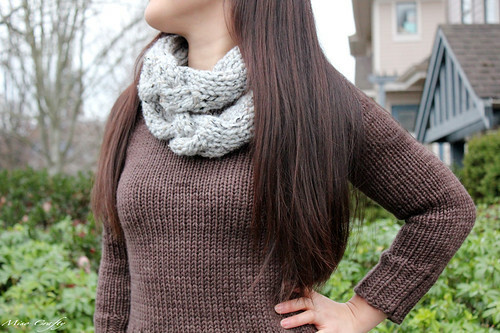 Anyhoo, when I first saw this pattern I fell in love with the oversized cables. I love cables. How they look and knitting them up. I just love them. So I knew that I was going to eventually be knitting this pattern up, it was just a matter of when. Thank you Jane, for making it sooner than later! Even though I love cables, I think I screwed up the cable section. Eep! I think I had skipped a repeat in my excitement of knitting up this pattern and in my haste to get this done so that I could wear it pronto. True story: I had to use a 9mm crochet hook to act as my cable needle. My actual cable needles kept sliding off for some reason and I can never find a DPN when I need one. 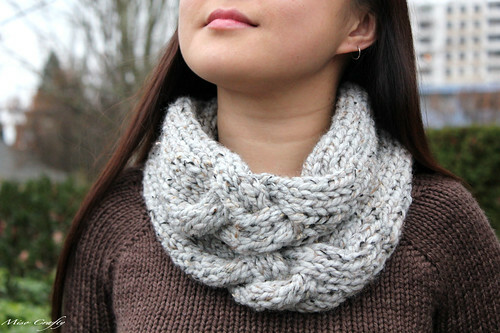 Another true story: I kinda felt awkward while knitting this cowl. I'm so not used to working with straight needles. At all. I'm a circular needle girl all the way. I don't think I've used straight needles in at least 4 years. And such chunky straights at that. I felt like I was knitting with broomstick handles. I'm even surprised that I still had straight needles in the knitting basket! 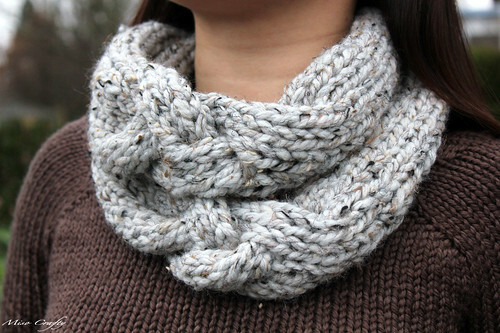 I absolutely love this cowl, but think I'm going to have to re-knit it using a different yarn. As much as I love the colour (it's grey! I think I'm still in a grey phase) and the tweedy yumminess (I'll always love tweed), I find that it sheds way too much and I constantly have to fish out the practically invisible fibre filaments out of my eyes and from in and around my mouth. I just have to find the right yarn(s)...from what I have in my stash. Long story short, I really have to start knitting from stash! More on that in another post. My only mod was that I did a crochet provisional cast on. Simply because my sewing skills aren't up to par and thought grafting the stitches together would be much easier for me. And it was. You can't tell where the ends were joined! Yay! 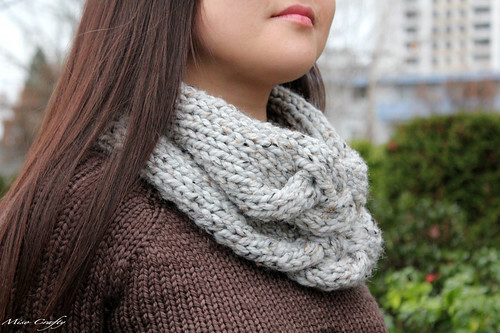 When I do make another Shannon I think I would do another repeat of the cable (just cause they are so nummy) and make it slightly shorter in length so that it'll hug my neck a little more. 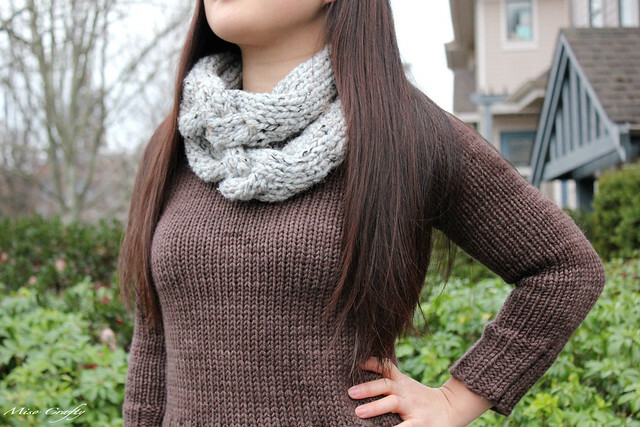 I think this is a super cute cowl and is great for when you want to add a little something something to an ensemble. Can't you tell that I took these photos the same day I took photos for my Chocolate Oatmeal pullover? Actually, I wore this outfit the entire day. Not only was it so comfy and cozy, but I was actually warm. Something I've rarely been since the weather has gotten so nasty cold on us. If and when it gets colder, at least now I'll be prepared! This looks so amazing on you! And the combo of the Shannon & the Chocolate Oatmeal Pullover is perfect (especially to keep the wind out of the wide neck!). ...oh and tell me about it with that yarn! Love the look of it, and even working with it was great. I didn't realize it was shedding until I had to photoshop pieces of fuzz off of my face after the photoshoot! Lol. Your Shannon looks fabulous! I love it! We have to all meet up and rock them together! I too am a big fan of Wilson Phillips and got razzed for hours from the hubs when watching Bridesmaids as I broke out into dance and sang the songs by heart. We're still young right??? Aside from the shedding into my mouth and eyes, I too didn't realize just how much it really shed until I saw the photos on Photoshop too! I had little fuzzy bits all over my sweater, didn't help that my sweater was of a dark colour either! Lol, that would be awesome...to gather everyone up and have everyone wear their Shannons. What a site that would be!